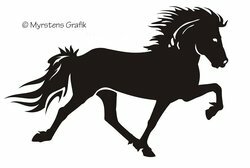 Icelandic horse Sticker in profile. Available in several sizes and colors. Contour cut in adhesive cast vinyl. Choose your size, color, and if you want the decal right or left aligned below.